Climbing the ladder of success in a career means something different to everyone and sometimes life pulls people in the opposite direction of what they plan. Dr. Anthony Corso, associate professor of computing, software and data sciences, said he wanted to be a chief financial officer of a major company but God had other plans. Many students strive to be successful in the business world but Corso was led in a different direction. He cofounded a small, abrasive manufacturing company with a partner following the completion of his master’s degree in technology management. He was the CFO of the company for three years and got it registered on the Over-The-Counter Bulletin Board, a public exchange list. A year after starting the original company, his group bought another company to complete the manufacturing aspect of the business. Corso decided to get his Certified Public Accountant license to improve his credentials for his company and make his way toward becoming CFO of a bigger company, but he decided to sell the company during that process to take a different path. 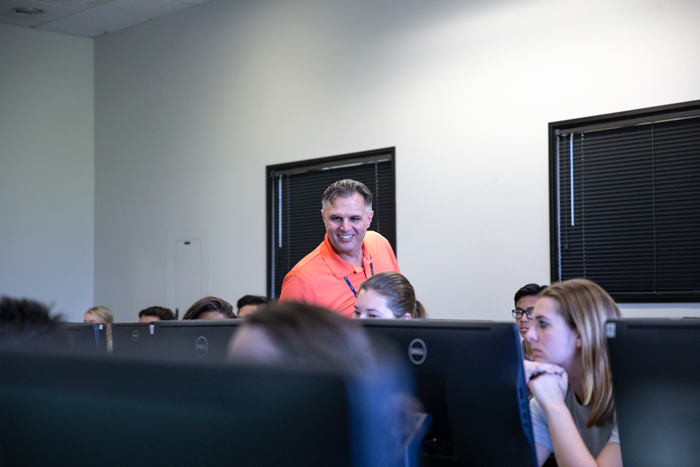 Corso came to California Baptist University as a student to take upper-division accounting courses for his CPA license and was offered a position as an adjunct faculty member while still enrolled. Corso said it was difficult to leave his company because he enjoyed the work he was doing. Dr. Gayne Anacker, dean of the College of Arts and Sciences and professor of philosophy, was the dean of the college that hired Corso. Anacker said Corso handled issues as Faculty Senate president well last year. “I was impressed that he dealt with them in a very careful and deliberate and sensitive way, even when they concerned difficult matters,” Anacker said. Corso said he attributes part of his success to having strong mentors over the years. He worked with a mentor at Silicon Graphics for 18 months after completing an internship with the company during his senior year of college. Emily Anderson, senior actuarial science major, was asked to be Corso’s teaching assistant after working on a data analysis project with him. Corso has taught at multiple post-secondary institutions and studied everything from architecture to technology and accounting. Corso’s career proves not everyone follows a traditional path. He said he may try to start another company in the future but he enjoys being a professor at CBU and has no intentions to leave.